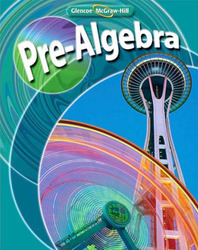 Glencoe Pre-Algebra is a key program in our vertically aligned high school mathematics series developed to help all students achieve a better understanding of mathematics and improve their mathematics scores on todays high-stakes assessments. Provide students with more personal assistance in understanding key examples with Personal Tutor, a virtual teacher available in every lesson. Prepare students for standardized tests with questions that are aligned in format, content, and design to those found on todays high-stakes assessments. Help students organize their notes and prepare for tests with Glencoes exclusive FoldablesTM study organizers. Help students organize their notes and prepare for tests with Glencoe’s exclusive FoldablesTM study organizers.